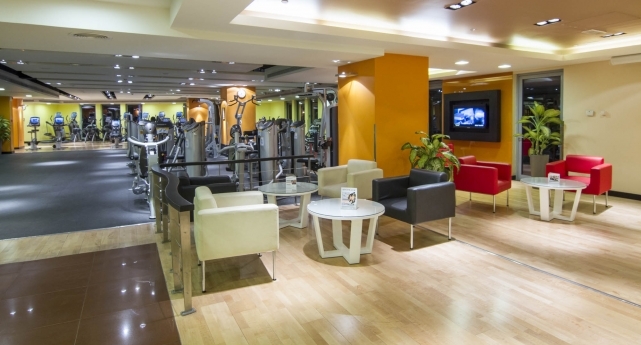 Golds Gym, situated conveniently on the second floor of the buzzing Business Village in Deira is a hotspot for daily gym-goers stopping for a quick workout and a break from their corporate lives. Buzzing with relentless energy, the gym boasts of an expansive layout spreading over two floors with a separate workout area for men and women. The facilities include cardio, weight-lifting and other machines in addition to on-site sauna rooms, making the location an all-inclusive and one of the favorites amongst members. The highlight of the gym environment is the continuous activity on the premises with regular classes running on zumba, pilates, martial arts amongst other popular activities and events. The Golds Gym franchise excels in its attractive offering of mixed and separate classes run by experienced instructors who guide members effortlessly through some of the most challenging activities. The trainers at the gym also aid members in personal training and goal setting to ensure all members are getting the most out of their workout regime and gym membership. Golds Gym is renowned in the region for its multi-purpose and well provisioned workout spaces and facilities in addition to their publicly held challenges that reward winners with attractive prices. Recently, Golds Gym was an integral part of Fitness Week rewarding members who met their weight loss goals, with gold coins and more exciting prizes! The gym also hosts several community events at Business Village to attract new members in addition to offering existing members with newer and more innovative spaces to workout.